Beijing’s approach to Hong Kong is a blow to larger hopes for Chinese democracy. These news updates sunk me into a chaotic mood. I quickly began to feel sad, without really knowing why. I was sent to Hong Kong as an employee for a Chinese company, and I worked there until 1997. I’ve also spent about half of the past four years in Hong Kong. I guess you could say I’m a mainlander who is relatively familiar with Hong Kong. But more importantly, my understanding of Hongkongers has helped me to come to a deeper understanding of myself and Chinese mainlanders. Hongkongers’ education levels and their general character is among the finest in the world. Although Hong Kong has existed in a crack between China and Great Britain since 1840, it has earned a reputation as the world’s most mature free city, where the rule of law reins. I know from experience the difference between mainlanders and Hongkongers. But today, this was the source of my sadness. I’ve always paid attention to Hong Kong. I have connections with more than a few mainland officials and intellectuals that deal with Hong Kong, not to mention all the times I’ve seen such people talking confidently on television programs or in magazines. Every time I hear them speak about Hong Kong, I get an anxious or even frightened feeling. 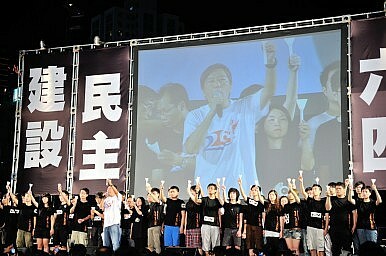 I’m deeply afraid that they will suddenly come out with a new idea and create a new means of “managing” Hongkongers. Now, Hong Kong’s “universal suffrage” is entirely an election with Chinese characteristics. This is not “one country, two systems!” Early on, when Deng Xiaoping was leading the creation of Hong Kong’s Basic Law, he said the law should be a rough outline, not a detailed one. After deciding on the large principles, Deng purposefully left ambiguous space on a number of other questions. He must have known that future generations would undergo reform and progress, and he believed in the wisdom of his successors. He was unwilling to smother Hong Kong to death through restrictions and equally unwilling to bind China fast. After Deng emphasized that Hong Kong would not change for 50 years, he even stressed that China could create a few more “Hong Kongs” on the mainland itself. But after all these years, what changes and improvements have there been to national governance or city management? There hasn’t been a single “Hong Kong” (a city of freedom and rule of law) created on the mainland. Instead, under Beijing’s vision and plans, Hong Kong could well become just another Chinese city. When some officials talk about Hong Kong, I can clearly detect the arrogant attitude of the “mother country” or even the “master.” In the eyes of some officials who deal with Hong Kong affairs, “one country, two systems” is a generous favor and the “freedom” and “rule of law” enjoyed by Hongkongers are made possible by these officials’ benevolence. One mainland official once said to me directly: Hongkongers have enjoyed such expansive freedom and rule of law for so many years — don’t they know what gratitude is? Why do they treat Beijing as the enemy? As he said this, his face was so full of misgivings that I could help but be suspicious. There’s no surprise here — Party officials have always used the same attitude and methods to manage every city in China. In their eyes, the residents of every region are all the same, and must be the same. When they talk about “loving the country,” is there any mainlander who doesn’t understand? Ultimately, what they are really talking about is loving them, the Party officials. But look at their level of corruption: look at the shamelessness of Xu Caihou, who held military power, and the hateful Zhou Yongkang, who oversaw China’s domestic security network. Look at the current situation, where it seems that every official is corrupt: can they really expect people to equate loving officials with loving the country? For now, mainlanders don’t have a choice — but Hongkongers, with their freedom and their rule of law, do. After so many years of knowing Hong Kong, I realize that all Hongkongers are Chinese, but Hongkongers most definitely do not want to become like mainlanders in terms of their culture and ways of thinking. The exacting Hongkongers want a democratic election with one person, one vote. I don’t believe for a second that Hong Kong will elect someone who opposes the central government, or even hates China and loves foreign countries. But Hongkongers are truly worried that, if candidates for chief executive are nominated by a small circle, then their chief executive will be just like the one-size-fits-all provincial Party secretaries and mayors we now have on the mainland. Is this worry really so hard to understand? When some officials use the cudgels of “loving the country” and “national security” to teach Hongkongers a lesson, do they not know that those of us Chinese who travel abroad frequently brag about Hong Kong, China’s “pearl of the east”? Hong Kong has the best quality rule of law and high moral standards; its society is orderly and the security situation is good. Why is my sadness so extreme? It’s because, though China began seeking democracy and constitutionalism a hundred years ago, these are still far-off dreams today. At first, they said China was too poor and couldn’t handle democracy, so everyone devoted all their energy to making money, without caring “whether the cat was black or white.” When we became rich, they said that the Chinese people’s character is too poor and isn’t appropriate for democracy, so we again were obedient — we studied hard and hoped that they would think we had already reached the level of character they required. When the education level had reached a certain point, they suddenly said that democracy doesn’t suit China — it’s a Western system. So we began to resist, saying, “Give us an Eastern system then — give us democracy with Chinese characteristics.” And they replied: “You are already living in a democracy, can you really not feel it? You don’t know your own luck!” And so they began to preserve stability; they began to suppress dissidents. Looking at Hong Kong, and thinking of China, my sadness is like Beijing’s smog — hard to dissipate. This piece originally appeared as a Chinese-language op-ed in Hong Kong’s Apple Daily. The original post can be found here. China Drafts Rules for Hong Kong ElectionsHong Kong Needs the World’s HelpChina’s P2P Protests, the United States, and the International Liberal-Democratic OrderLawfare Waged by the Hong Kong Government Is Crushing the Hopes of DemocratsDemocracy in Asia: A Glass Half Full or Half Empty?